How one creative teacher is using yoga movements to enhance people’s connections to Judaism. Class Description: We start with thank you. We say Modeh/Modah Ani upon waking, which is one big “thank you” for keeping me alive and waking me up, and go on to the morning prayers, which say thank you for opening eyes, mine and others, for straightening the bent, my body and others, for guiding my steps, etc. The prayers can be seen as an analogy for all humanity, but also for getting me out of bed and just, well, thanks. Then, after the grateful blessings, we say “wow.” All the Songs of Praise follow, the “wow” of the wonder of it all, and of God. Isn’t that amazing? I use this map, this framework already handed down to Jews for thousands of years, to thematically and literally order the yoga movements of the class. Why did you want to start your classes in Jewish yoga? As a former professional dancer, and a yoga person and then teacher, I have always learned kinesthetically. I always felt like even my own spirituality was through my body, that somehow I felt a kind of God presence while focused on expanding, stretching, and playing with my own body’s boundaries. Taking care of and being aware of the body is a very Jewish attribute. (Even the Rambam said, and I paraphrase, “To know Torah you must care for the soul and the body; the soul is ranked first but the body comes first…”) It seemed natural to want to merge that way of learning with understanding Jewish concepts, beliefs, and prayers. It has been fascinating to uncover the rich history of movement within the tradition. From the present-day shuckling (swaying) in shul, to Torah processionals, to the time when David danced half naked in front of the Ark, and Miriam led the women into song and dance, movement and body consciousness have been a part of Judaism. Doing Jewish yoga is a way of reclaiming the body in connecting to God or your own personal version of Divinity. I also got tired of the headier textual study: Judaism is a lived religion, however orthodox a person wishes to embody it. The rituals include physically doing something to create spiritual connection. Doing Jewish yoga means physically understanding what it is to be thankful for girding Israel (us) with strength, or straightening our bent bodies—two prayers from the morning blessings. It means truly listening to our bodies’ responses to our own relationship to God and prayer (or as a friend says, “shma’ing the body”). What do you think women get out of the classes? I hesitate to label what women, as opposed to men, get out of the classes. 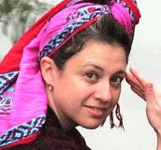 It would be easy to say that women are more open to new ways of learning in Judaism, especially if you’re talking about more traditional Jewish learners and learning methods, since they were traditionally left out, but many men in my class are the first to groan and moan and express their eagerness to work with their bodies as metaphors for their own truth. Often, women are the teachers, so they get role models. And, when I teach in Orthodox circles, such as at Orot College in Israel, it is only women who take the course. What was one of your best teaching moments? I’ve been lucky to have had quite a few high points recently. One was when I was leading an Embodied Shabbat ceremony, working with my rabbi and a musician. We were following what I consider to be the main parts of a morning service, especially Shabbat morning: gratitude, praise, listening, and asking. These parts correspond to the prayer and song sequences of the morning service. The group got so involved in the gratitude part—which includes yoga poses, chanting, getting warmed up, and saying what they’re grateful for—that, quite naturally, the songs of praise, specifically the Elohai Neshama prayer, thanking God for the Breath of Life, came out of the crowd and into their bodies. I barely had to lead—just had to facilitate the natural expansion of the group’s energy. But I must say the most humbling and exciting moments are when I get those students who approach me saying that somehow, in some way, what they did in my class brought them closer to their Judaism, or their souls. Surprisingly enough, some of the more religious women I taught in Israel had this reaction. I was pretty blown away. Those women are so in love with Judaism that they make the gender differentiation look almost inviting. So, for them to say this to me, a Conservative-born feminist Jew who looked into Hindu yoga for my spirituality before returning to Judaism, is a pretty big honor. What is the most challenging aspect about teaching your class? The first five minutes. Always. Getting people to let go of their expectations… of whatever… a yoga class, a Jewish experience, what dance is, what it means to be Jewish, or what it is supposed to look like. Usually by minute six, but certainly by twenty, we’re all ok with where we are. How does your class help women connect to Judaism? I think, again, because of the traditional ways in which women were expected to behave or pray, this presents an egalitarian concrete connection to Judaism that bypasses those more male-dominated approaches. What one lesson/message would you like to share with our readers? Judaism rocks. And rolls. I mean it. I am in my mid-40s and I envy what is around now for younger women and men who are seeking a spiritual Judaism, not a rote, watered-down Judaism. There is a lot out there to get connected to—eco-Kosher, environmental awareness; the Torah is a pretty amazing guide if you’ve found smart, spiritually aware, and holistically oriented teachers to help lead you. And there’s more and more of those teachers, and some of them are in their 30s and early 40s. Find them; Judaism needs you to continue its mission of bringing Heaven and Earth together—making the material, spiritual and leading the earth into better times. If not now, when? (Ok, got a bit soap-boxy there… but Hillel had it right). When do you personally feel most Jewish? On Friday nights. The small stuff—lighting candles, saying the blessings, watching my partner’s (and soon my step-) children tear at the challah like they’re Siberian refugees. And then, kibbitzing in shul on Saturday, mixing small talk with prayer. It is the ease of the material and spiritual that makes Judaism interesting. In what other religion is it written that a man is supposed to please his woman, and yes I mean sexually, especially on Shabbos, as much as possible? Got to admit, girls, we got pretty lucky on that one. What question do you wish I would ask, and what is your answer? Question: where can I go for cool Judaism? Keep looking for good, plugged-in resources, like Elat Chayyim—the Jewish renewal spiritual center based at Isabella Freedman Jewish Retreat Center in Connecticut—with courses almost year-round. Romemu in New York—a place where there is yoga and meditation before the amazing chanting Shabbat service. Check out the Aleph Kallah—an every other year event, but an ongoing resource for teachers and ideas. If you’re an artist yourself, your local Jewish Federation probably wants to hear from you and how you can connect what you do with local day schools and Hebrew schools. Judaism needs young vital minds, bodies, and souls to keep falling in love with it, to find out about its desires for peace (yes, peace! ), healing, and love; not just law, rules, and restrictions. Jodi P Falk is an international educational consultant, choreographer, dancer, yogi, and teacher. Her work centers on the vehicle of movement and the arts to promote educational wellness, conflict resolution, proficiency, and personal and spiritual power. Visit www.dancingsoul.org to learn more about her program.